ALS has been all up in my face the past few weeks. It feels weird that something I heard about rarely before my mom’s diagnosis is now something that I can’t stop hearing about. A few nights ago, I broke down in Rich’s arms. Elliott’s death in some ways eclipsed my mom’s and there is still grieving to do for her that I’ve clearly neglected. But all of the videos asking people to donate to various ALS foundations while talking about the devastating effects that are a result of this disease – it finally got to me. In the months after my mom got her diagnosis, she began developing a YouTube playlist that she watched regularly. Most were songs that were there as an encouragement through the darkness, but there were at least a few on the list that were there simply to make her laugh. They didn’t offer any kind of inspiration or spiritual help. They were just funny. As time went by and the disease progressed so. very. fast. her laptop was never far away. Even when it became almost impossible to understand what she was saying, she could point to the computer and we could watch through her playlist. Whether it was a Kmart commercial telling us that we could all ship our pants or Mandisa’s Good Morning, we could sit together and smile. I’ve watched the Ice Bucket Challenge and I’ve had mixed feelings about it. On one hand, I love seeing ALS being brought into the public eye. I love that people are becoming more aware of this disease and the way that it impacts lives. I love that people are donating to help fund ALS research (at the time of this writing, the amount raised is over $70 million). I love seeing people from all over the political and social spectrum coming together to support this cause. It was hard for me see people laughing in the context of raising awareness for something that caused us so little laughter. It felt wrong to laugh about anything related to ALS at all. ALS is all tears. But as I scrolled through YouTube, finding some of my favorite celebrities and watching their challenges, I couldn’t help but laugh. And I thought about my mom’s own YouTube list and the laughter that it brought her, even in the midst of her tears. And that is what the Ice Bucket Challenge has reminded me. Yes, this is a frightening, debilitating, terrible disease. It steals motor function, voice, breath, life. But it is not what has to define ALS sufferers. They are more than their disease. After diagnosis, my mom continued to volunteer at the nursing home where she had worked for years. During her therapy, she encouraged the others in her group. She laughed as long as she could, then she smiled as long as she could. And in her last lucid moments, she held each of us in her eyes and told us she was ready to go. As she was drifting out of consciousness for the last time, she kept raising her right hand. We speculated that she was raising it to greet her dad or her aunt or any of the others who had gone before her. Maybe she was raising it in praise as she was seeing the beauty on the other side. As we sat with her with our tears, I wonder now if she was just slapping her leg with laughter. 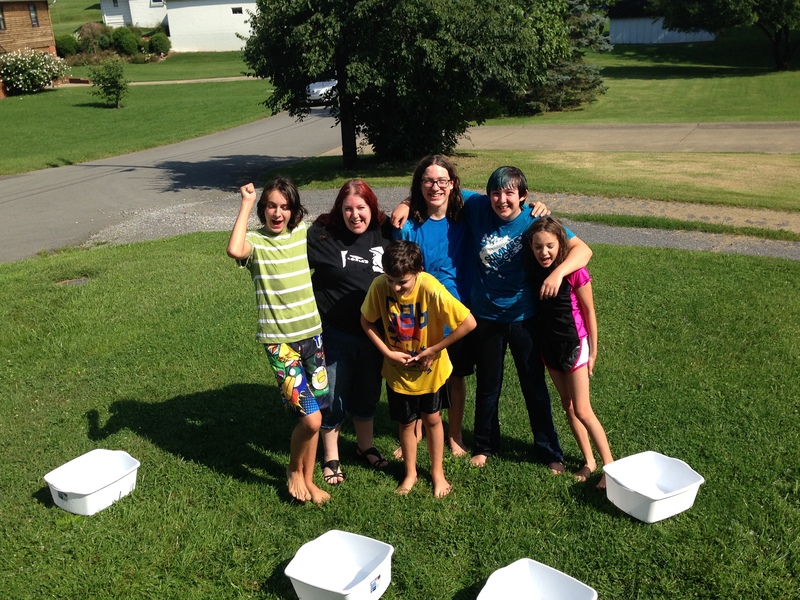 This entry was posted in Grief and tagged #IceBucketChallenge, #strikeoutals, ALS, death, grief, terminal illness. Bookmark the permalink. Congratulations on embracing joy and laughter as being important ingredients to handling pain, loss and sadness.